An easy little vegetable samosa that makes a delicious, inexpensive lunch from storecupboard ingredients. Heat the oil in a small non-stick pan and fry the mustard seeds for about ten seconds, or until they begin to splutter. 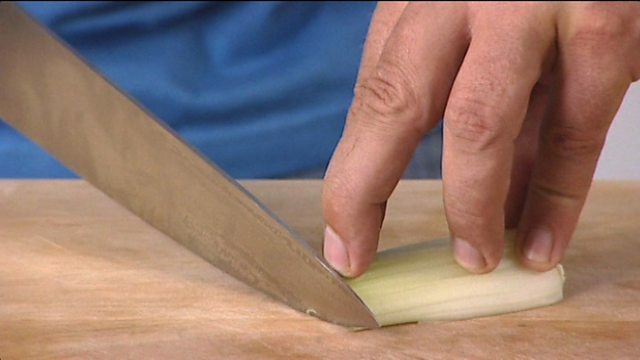 Add the onion and ginger and cook for 2-3 minutes over a high heat. Add the peas, stir well and add the spices, mango powder, salt and a splash of water. (If using lemon juice, add this instead of the water.) Cook for 1-2 minutes, then add the potatoes and coriander and cook for 2-3 minutes. Taste and adjust the seasoning. Unroll the pastry and cover with cling film and a damp tea towel. Peel off one piece and keep the rest covered so that it doesn't dry out. Lay the pastry sheet flat on a clean surface and brush with melted butter. Fold in one third of the pastry lengthways towards the middle. Brush again with the butter and fold in the other side to make a long triple-layered strip. Place one rounded teaspoon of the filling mixture at one end of the strip, leaving a 2cm/1in border. Take the right corner and fold diagonally to the left, enclosing the filling and forming a triangle. Fold again along the upper crease of the triangle. Keep folding in this way until you reach the end of the strip. Brush the outer surface with more butter. Place onto a baking sheet and cover while you make the rest of the samosas. Sprinkle over a few sesame seeds, if using. Bake in the centre of the oven for 30-35 minutes, or until golden and crisp, turning halfway through the cooking time. 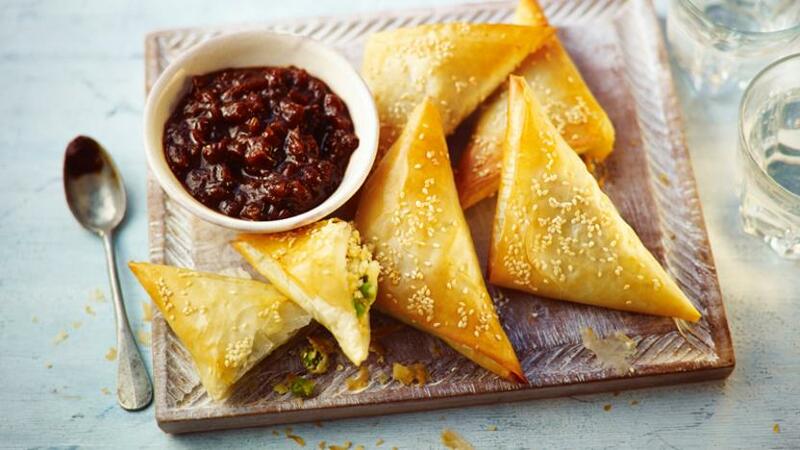 To serve, place the samosas onto a large serving plate with a bowlful of chutney.